Sister Joan Anna Lyons, S.S.J. Sister Joan Anna Lyons, S.S.J. 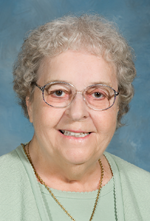 (formerly Sister Saint Christopher), died Sept. 23 at St. Joseph Villa, Flourtown, at age 86. She was in the 68th year of her religious life. The daughter of James Lyons and Lillian Hines, she was born in Camden, N.J., and attended Holy Name Grade School and Camden Catholic High School. Sister Joan ministered in the Archdiocese of Philadelphia and in the Allentown and Camden dioceses. She was the sister of the late Albert (Laura), Mickey (Cecelia), Donald (Helen), Jack (Virginia) Lyons and Helen (Jack) Richards. She is also survived by nieces, grandnieces, grandnephews and members of her congregation, the Sisters of St. Joseph of Chestnut Hill. The funeral Mass was celebrated Sept. 28 at St. Joseph Villa. Donations in Sister Joan’s memory may be made to St. Joseph Villa, 110 West Wissahickon Avenue, Flourtown, PA 19031-1898.